SANTA CRUZ ISLAND -- Two bald eagle chicks were born in the Channel Islands National Park on Santa Cruz Island. 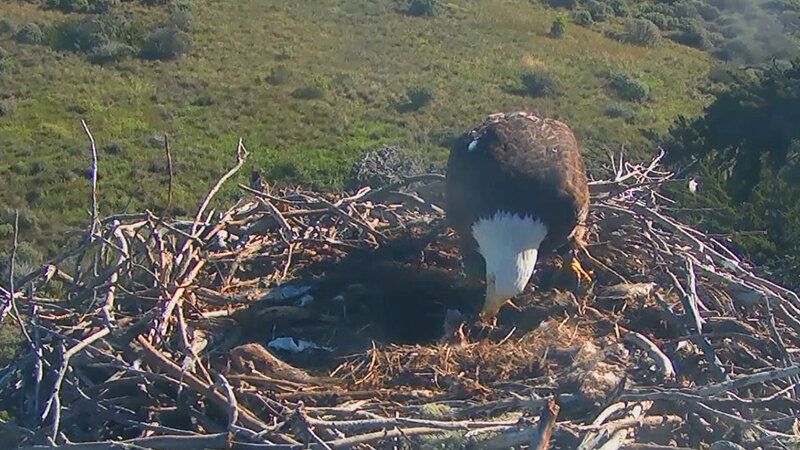 The National Park Service captured the mother eagle feeding her newborns in webcam footage. The first egg hatched Saturday and the second on Monday. Bald eagles disappeared from the Channel Islands in the 1950s because of DDT contamination and hunting. But since 2006, the majestic national birds have re-established territories on most of the islands. For the two parents, this is their first successful hatch after trying for three years. The bald eagle is one of the largest birds of prey found in North America. They can typically be found near large bodies of open water with a stable food supply and old trees that are ideal for nesting. To watch the live stream of the eagles in their nest, click here.